Yes, I know it’s been many many moons since I posted on here but I do have news. I have not one, but TWO, books out next week. On Monday February 19th, the second book in the Little Cornish Isles series is released as an ebook. Spring on the Little Cornish Isles: The Flower Farm is set on the gorgeous fictional Scilly isle of St Saviour’s – on a farm that grows beautiful scented narcissi. 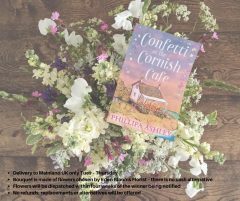 On Thursday February 22nd, the paperback edition of Confetti at the Cornish Café series hits the shelves of bookshops and can also be ordered online from Amazon, Waterstones and other retailers. I want to thank you for making the Cornish Café series Amazon Top 100 and Bookseller Heatseekers bestsellers in digital and print formats. I hope you love both new stories. I’ll be taking part in a blog tour from next week and I’ll post the stops here so you can read exclusive extracts, and some posts about my inspiration for The Flower Farm. 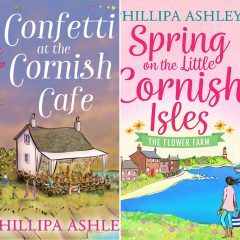 Keep following me on Twitter @PhillipaAshley and on Facebook where you’ll find all the very latest news, exclusive competitions to win signed copies and goody bags – I hang out in both places and chat to readers. I have exciting news to hopefully warm you up! 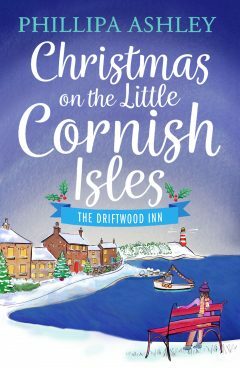 The first book in my brand new series: Christmas on Little Cornish Isles: the Driftwood Inn is available to order now – and published on September 18th in e-book and November in paperback. You can get it from AMAZON here. It’s never too early for a mince pie, is it? And looking at the rain and chilly temps out there, I think I need one. Christmas has arrived on the Cornish Isles of Scilly, bringing mistletoe, surprises and more than a sprinkle of romance . . . Fans of Poldark and Carole Matthews will love this brand-new festive read from the author of the bestselling Cornish Café series. Happy Friday, everyone. Some bargain book news and party gossip to share today. First the book news. Amazon has put two of my ebooks on a 99p deal – I don’t know for how long so if you fancy a summer escape and haven’t read them yet, go for it. 🙂 Confetti at the Cornish Cafe and The Little Deli by the Lake. 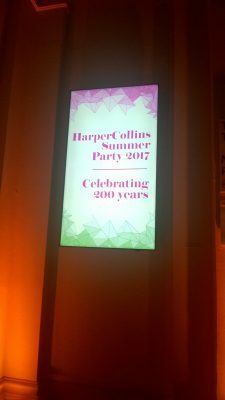 If you follow me on Twitter, you may also have noticed that I went to my publisher’s 200th birthday party at the V&A on Wednesday. Lots of author friends went too. In fact, we still haven’t shut up about it 🙂 so I’m going to share a few pics here. As we spend most of our time sitting at home writing, we were all hyperventilating with excitement at being able to get dressed up and do some star spotting. I saw Jeremy Paxman, Simon Callow, David Baddiel, David Walliams and the boys from the band, Blue. 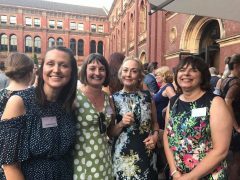 I didn’t dare go up to any of them but we did chat to the actress Paula Wilcox from Man About the House, Emmerdale and Upstart Crow – she is absolutely lovely. 🙂 There was also a fabulous cocktail bar and the bar staff were in no way attractive. Judge for yourselves! The director, Hazel, helped me with research for Confetti at the Cornish Cafe and she has offered this amazing arrangement for the competition. She even makes a cameo appearance in the book. Enter HERE on the Avon Books UK Facebook page. Hello from me on this wet and windy day. If you’ve been waiting for the special Cornish Cafe contest, it’s now happening today! My thoughts are with everyone involved in these dreadful times but I also think the best thing we can do is carry on our lives in the face of it all. At the moment there’s a blog tour going on where you can read reviews, excerpts and posts from me about the book, my writing life and favourite Cornish places.